It’s really hard to resist this one. My friend Justin of JustCookNYC first introduced me to the beauty of cheese balls, and they’ve officially become my favorite party food. In fact, I couldn’t wait to try making my own version for my party in December and you can bet that I’ll be making this again at a Super Bowl Party in a few weeks. I highly recommend you take my advice and try this one, too. As I mentioned when I recently posted my fresh kale salad with queso blanco recipe, queso blanco is a creamy, soft, and mild unaged white cheese that is served all over Spain and Latin America. You can see what it looks like inside of the packaging, above, and the best part of buying it is that half of the cheese went to the cheese ball and the other half went to my fresh kale salad. Basically, a huge win-win! 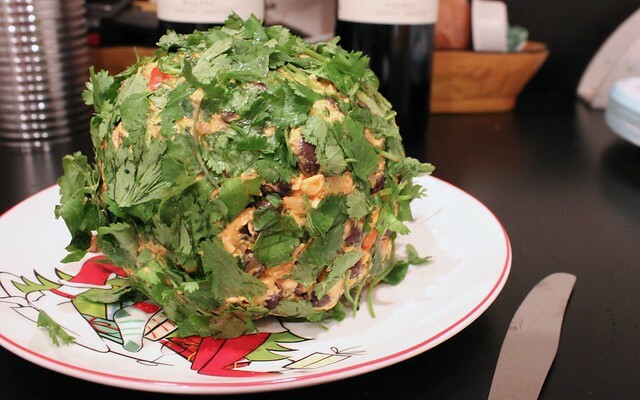 The only thing I think I would change about this recipe is I would spend a little bit more time finely dicing the cilantro that I used in the cheese ball. Other than that, combining all of the ingredients turned out to be quite easy. Doesn’t it look lovely? That gold color of the cheese ball was one of my favorite things about it, actually. It was all thanks to the powerful spice combination of cumin, smoked Spanish paprika, cayenne, chipotle and chili powder. To be honest, this one didn’t turn out to be quite as spicy as I thought. If you want a little bit more of a kick, all you have to do is add some more jalapeño. It’s easy! 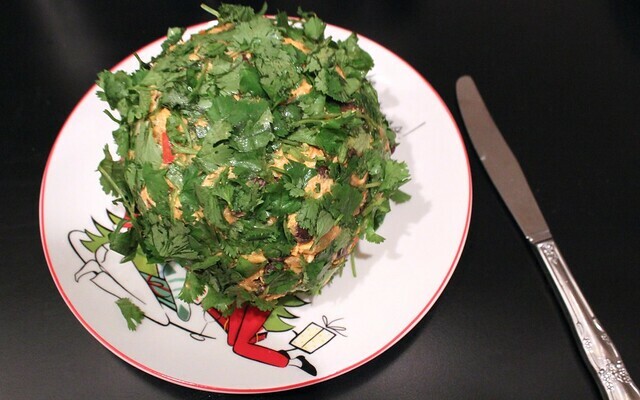 Inspired by Michelle Buffardi's wonderful cookbook GREAT BALLS OF CHEESE, I made this sort-of-Cuban-a-little-Mexican version for a Holiday party. It was a huge hit! If you want it spicier, feel free to add a whole jalapeño and more spices to taste. Serve with baked corn tortilla chips. 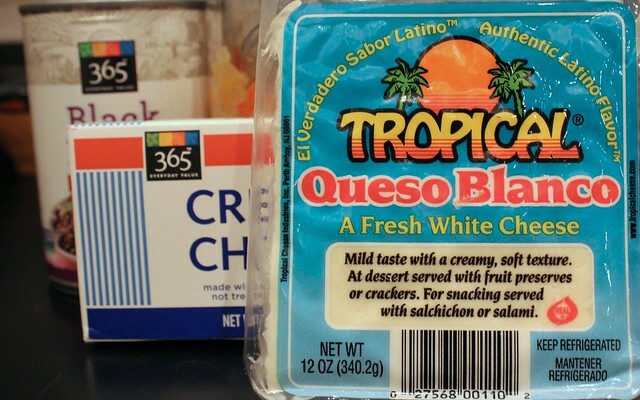 Combine the cream cheese, queso blanco, black beans, sofrito, jalapeño, ½ cup of cilantro (save the rest to coat), salt and spices in a large bowl. Mix together with a stand mixer or a spoon. Then, using your washed hands, form the mixture into a ball. Put in fridge and cool for at least 2 hours, or overnight. 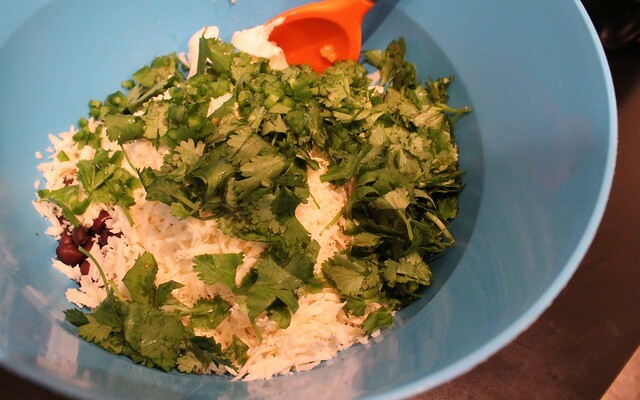 Just before serving, spread the rest of the cilantro on a plate and gently roll the ball to coat it all over. Finally, serve at room temperature with baked corn tortilla chips or your choice of chips. 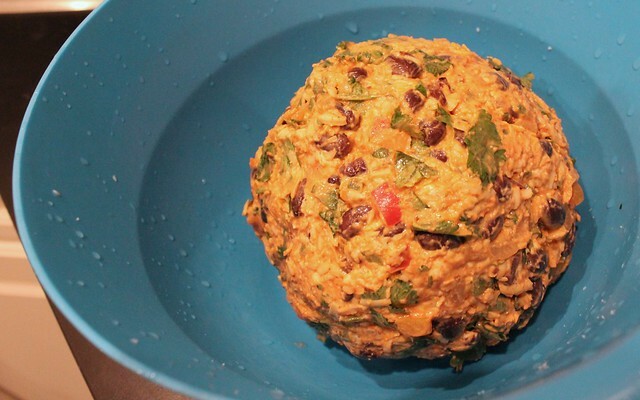 Will you be going to a Super Bowl party and bringing a healthy appetizer? This entry was posted in Appetizers, Cuban, Gluten-Free, Holidays, Snacks, Spicy, Vegetarian and tagged appetizers, cheese, cheese ball, cuban, party food by Irina Gonzalez. Bookmark the permalink.